For transmission lines, the program automatically assigns the names X-1, X-2, X-3, and so on. The bus from which the transmission line connects, which must already exist on the one-line. Ensure that the From Bus has the same base kV as the transmission line's To Bus. For reference, the From Bus base kV is displayed next to the bus name. The bus to which the transmission line connects, which must already exist on the one-line. Ensure that the To Bus has the same base kV as the transmission line's From Bus. For reference, the To Bus base kV is displayed next to the bus name. This check box is selected by default and causes the entire line to be displayed. By clearing the check box, the line is only be shown as a short section at each end with labels indicating the bus to which the other end is attached. Choose either US, Metric, or Per Unit. If Per Unit is selected, only the impedance and amp rating fields are available. No/Phase Total number of lines modeled. The default of one (1) means one conductor per phase. Two (2) means two conductors in parallel per phase, and so on. When two or more conductors are in parallel, the impedance of the circuit is decreased by that factor. The impedances shown in the dialog box are for one conductor only, and are not based on the No./Phase field. If you enter these values instead of using Calculate, make sure they are for one conductor only. This lets you to easily check handbook values without additional arithmetic. The Calculate button does not consider bundled conductors at this time. Material Material (copper, aluminum, aluminum cable steel reinforced, or Copperweld®). Size Conductor size in AWG or MCM. For more information, see the Aluminum Electrical Conductor Handbook. The length of the line in miles or meters. Temperature of the loaded conductor. This can be varied from 25°C to 250°C depending on the type of study being performed. This temperature is used in determining the resistance of the conductor. Earth Res Earth resistivity in ohm-meters. This value is used to determine ground impedance. A default value of 100 ohm-meters is typically used when measured data is not available. For more information, refer to IEEE Std. 142. GMD Geometric Mean Distance of the conductor spacing. This value is used to determine the impedance of the line. Typical default values are used based on the kV of the line. Average Height Average height of the transmission line in feet. This value is also used to determine the line impedance. Typical default values are used based on the kV of the line. Impedances are described in ohms/mile or ohms/km, except for Xc, which is in megaohm miles or megaohm km. For more information, see the Westinghouse Transmission and Distribution (T&D) book. Xc Shunt capacitive reactance. If you enter this value as zero (0.0), "infinity" is assumed. Xc0 Shunt capacitive zero sequence reactance. If you enter this value as zero (0.0), "infinity" is assumed. Rating Conductor rating in amperes. This field is used to determine line overloads in power flow analysis. 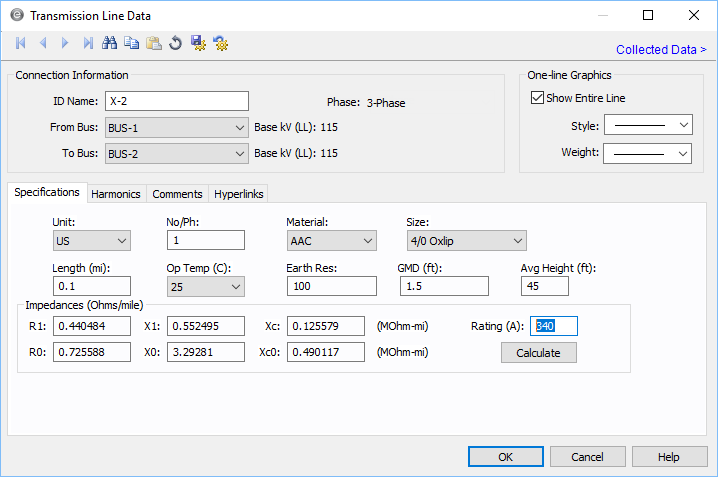 If you use Calculate, this value is calculated as the No./Phase times the rating of one conductor, which is brought from the device library.